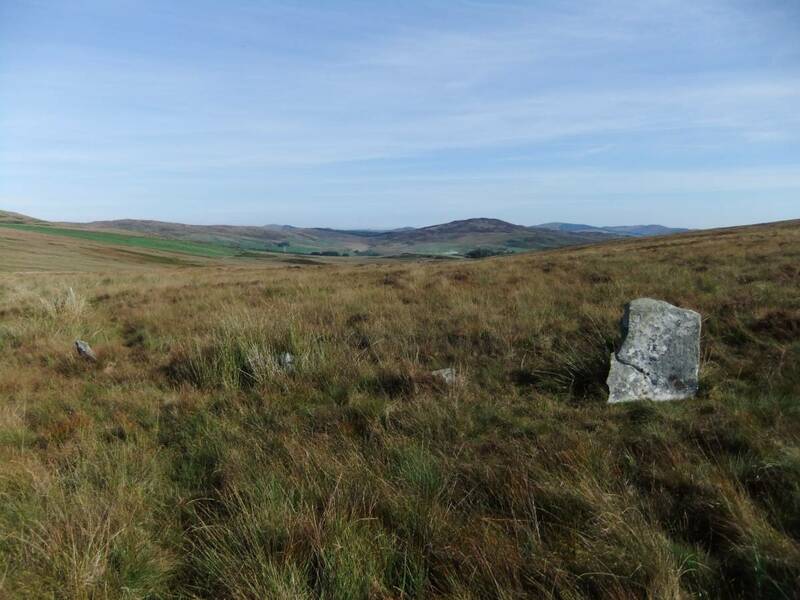 Record Description This stone circle is located in close proximity with, ie immediately adjacent to a substantial round cairn and ring cairn on the southern side of the Cauldside Burn opposite to the eastern slopes of Cambret Hill. 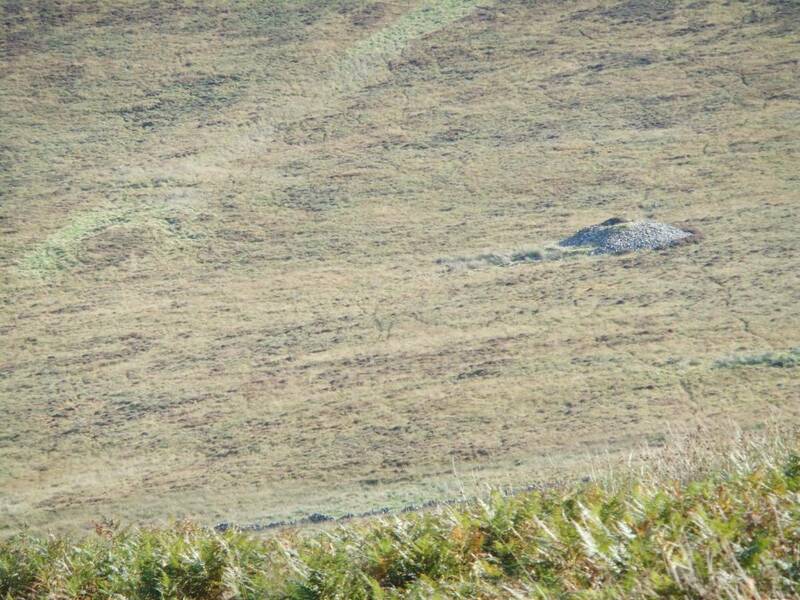 The very fine six turn spiral marking mentioned in SWAAG Record 758 is located on the lower eastern slope of Cambret Hill some 400m to the E on the opposite side of Cauldside Burn. For the context of this spiral and other rock art in Galloway see also SWAAG Record No 758. 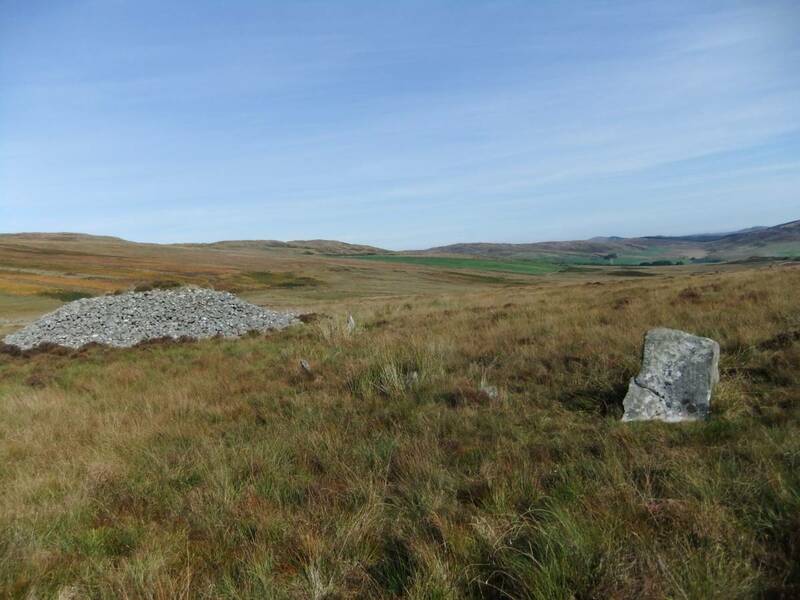 The stone circle at Cauldside Burn has been surveyed by Professor Alexander Thom together with his son Dr Archie Thom. Thom A. and Thom A.A 1980. 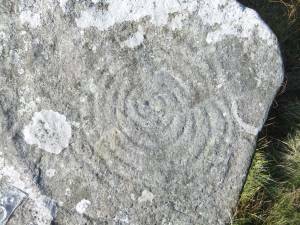 Megalithic Rings,B.A.R.81. 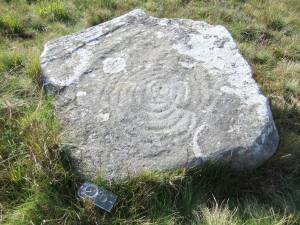 During a full day of field walking in the area of the stone circle, several further prehistoric sites were noticed, namely: 1. 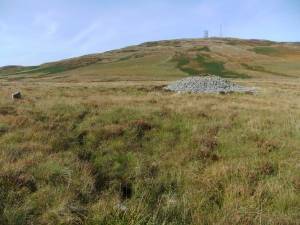 Clearance cairnfield with at least 20 stone dump cairns on the southern slope of Cambret Hill uphill of the spiral marked rock. 2. 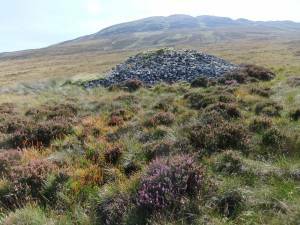 At least three larger well built stone cairns which may be burials in heather moorland east of the stone circle and large round cairn. The largest of these is at NH53243 57173,225m OD 3. 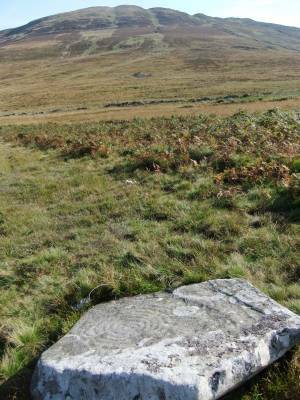 In spite of searching I was unable to locate the fine cup and ring marked rock SW of Cauldside by the Cuttie Burn which is recorded By R.W.B. Morris and located on the 1:50000 OS map. 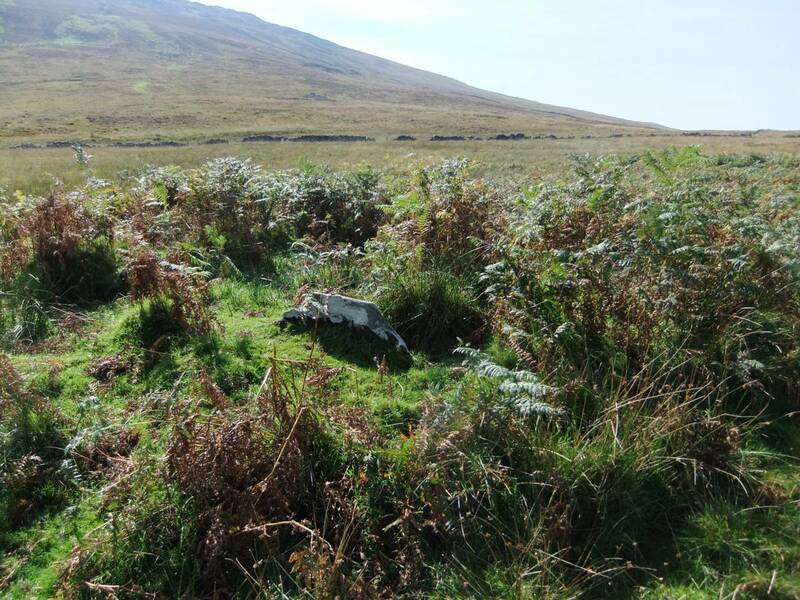 Additional Notes The effect of reduced grazing on moorland monument visibility: This record and the photographs were taken during my second and most recent visit to Cauldside Burn. It was immediately apparent that the stone circle and the ring cairn were obscured by thick moorland vegetation. 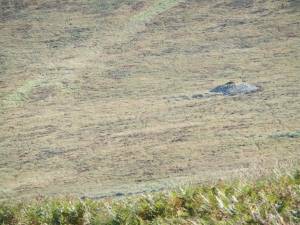 The ring cairn and all the smaller stones in the stone circle were practically invisible. Walking across the area was much more difficult than previously. Alexander Thom devoted 40 years to accurately surveys of all or most of the known stone circles of the British Isles in search for their possible astronomic purposes. 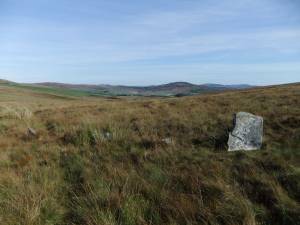 His son Archie Thom, Professor of Engineering at the University of Glascow, also surveyed the then recently recognised stone circles on Barningham Moor and at Mudbeck in Arkengarthdale , in my company during 1979/1980 . Image 1 Description The stone circle and cairn at Cauldside Burn. 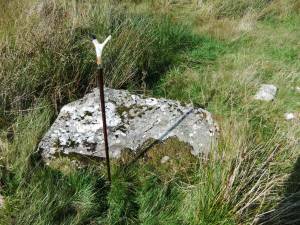 Only the largest stones are visible ,the smaller stones are obscured in rank vegetation. 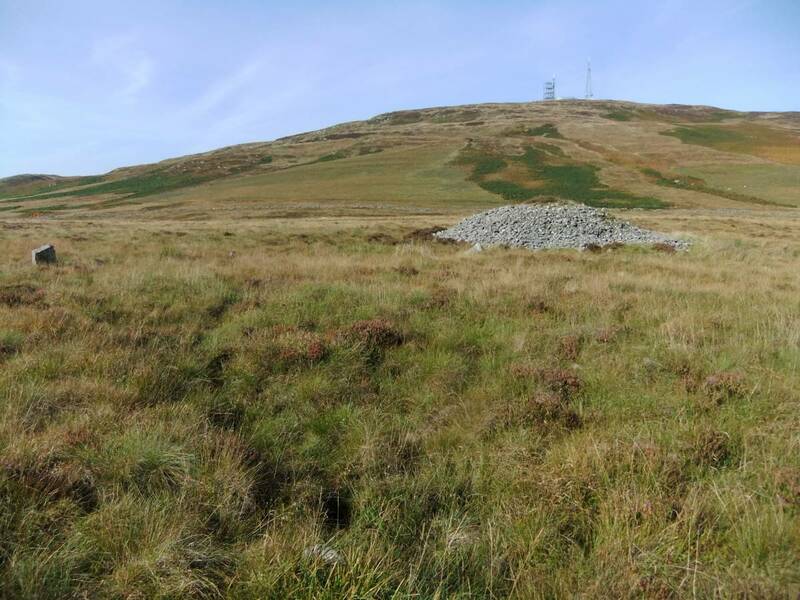 Image 2 Description The area of the Cauldside Burn Cairn and Monument Complex photographed from Cambret Hill. 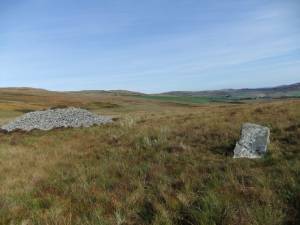 Image 4 Description View down towards Cauldside with the largest stone of the Cauldside Burn Stone Circle and the adjacent Round Cairn. 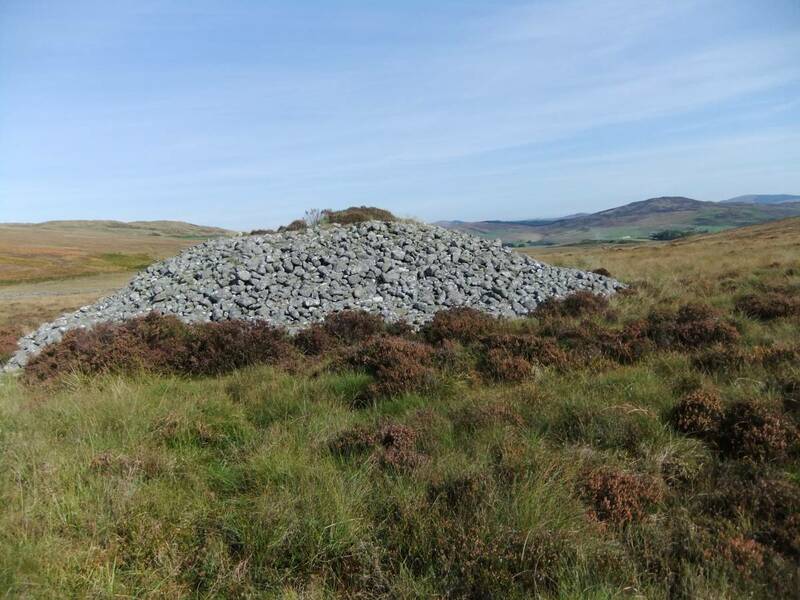 Image 5 Description The round cairn. 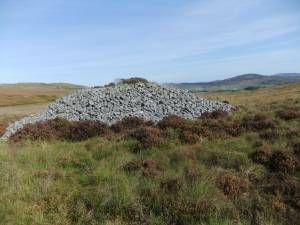 Image 6 Description The round cairn. Image 7 Description Spiral marked rock on the opposing northern side of Cauldside Burn. Image 8 Description The spiral. 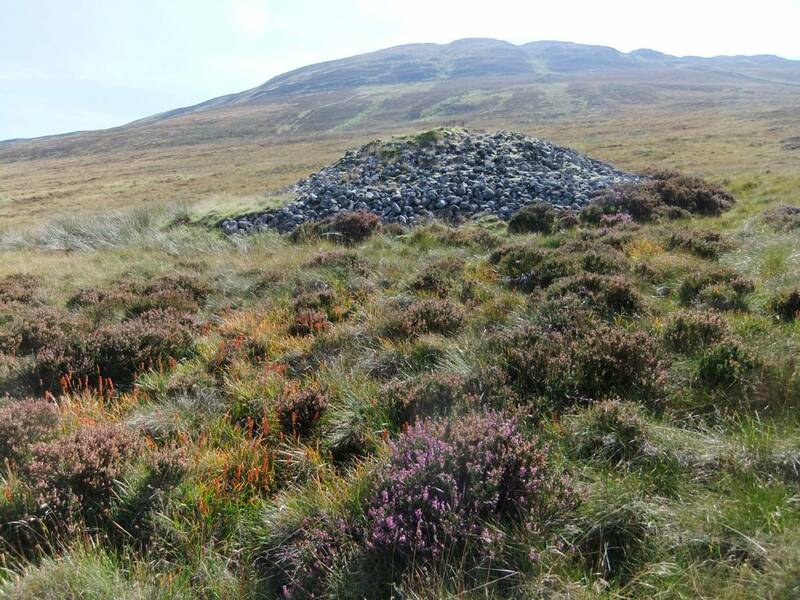 Image 10 Description The ring cairn and central cist obscured by vegetation. Image 11 Description The assumed cist cover slab of the cairn within the ring cairn.